I have combined the 75 and 120 gallon tanks to one 150. The tank is 75 gallons, 3/5 water with a gravel substrate and layers of rock on one side planted with african violets and clover with some moss here and there. There are 3 Fluval submersible filters and two small heaters, one on each end. 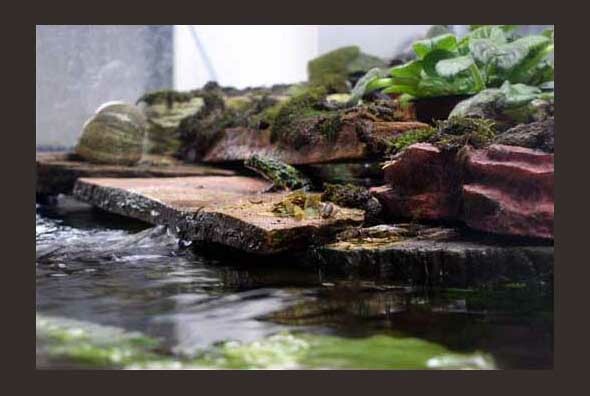 The occupants include four oriental fire-bellied toads, four African dwarf frogs, four fire-bellied newts, all the varieties of live-bearing fish I can find, a chocolate pleco, a clown pleco, a mystery synocat,three dwarf cory cats, two apple snails, and countless tiny snails. The lighting is two fluorescent bulbs, one of which emits uvb and the other a plant bulb. You can see some crickets in front of the toad, eating the same flake foodthat I feed the fish. I also give the toads a few waxworms twice per week.